OpenBSD Install via IPMI on SuperMicro Server | tech stuff. This is a step-by-step guide for how I remotely installed OpenBSD 5.0 to my SuperMicro X8SIE-LN4F based server. This includes setting up IPMI and remote serial console. Boot the server and set a static IP for the IPMI Configuration in the BIOS setup. I guess this might not apply to you, but I like it. Connect to the IPMI web server, upload your SSL certificates, set your admin user passwords, etc. Constrain IPMI to the Dedicated LAN interface. The BMC on this server supports two modes of operation. It has a dedicated 100BaseTX port, but it can also piggy back (with optional VLAN tagging) the first system ethernet port. By default the system comes configured to do some sort of failover between the two. It will use the dedicated LAN port if connected and piggy back the system port otherwise, but I’m not sure of the exact failover behavior. I don’t like this behavior, though, because it increases the risk of having the BMC sneaking onto my front-end network and exposing its relatively insecure IPMIness to a broader audience.You can disable this behavior by setting LAN Interface to Dedicate under Configuration -> Network in the web UI. Pay special attention to the Serial Port Number field. It should have an asterisk next to the port name. This asterisk represents the serial port used by the BMC. Redirection after BIOS POST should be set to Always if you’re going to use SOL to do the install. Otherwise you can set it to Boot Loader. Install OpenBSD. It’s easiest to do the initial install via the java remote console and enable the serial console after booting into the OS. If that option isn’t available to you, though, you can do a full SOL install with these steps. Make sure you set Redirection after BIOS POST to Always. Pay attention to the number convention here. 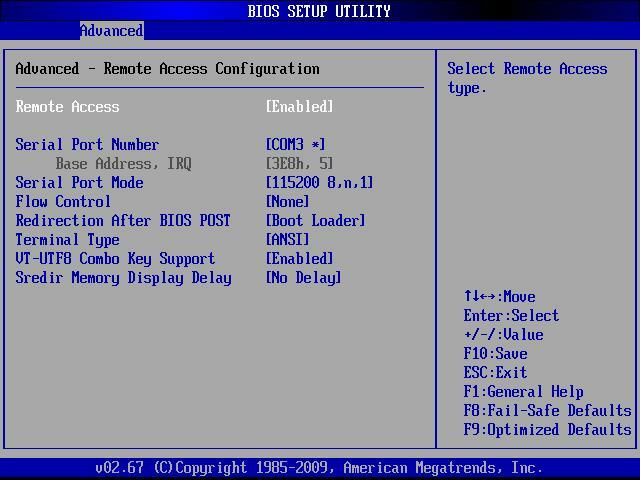 We’re using the third serial port, which the AMI BIOS calls COM3, but OpenBSD names com2. Install OpenBSD as per your preference. If using AMD64, you’ll need to immediately interrupt the bootloader via SOL, set tty pc0, and rely on BIOS Console redirection to perform the following steps. Disable post-boot BIOS console redirection. From this point on, OpenBSD will handle the serial devices directly, and it will do a better job than the BIOS VGA redirection. To make sure everything runs smoothly, disable the post-boot console redirection in the BIOS by setting Redirection after BIOS POST to Boot Loader in Advanced -> Remote Access Configuration.